→Triturating Juicers Explained – Are They Worth Your Investment? Buying a new juicer is not as simple as it may seem. There are various types of juicers you can choose from and each type has its pros and cons. Triturating juicers, also known as twin gear or double auger juicers, are typically the more expensive models on the market. But they are also known to create the best quality juice you could wish for. 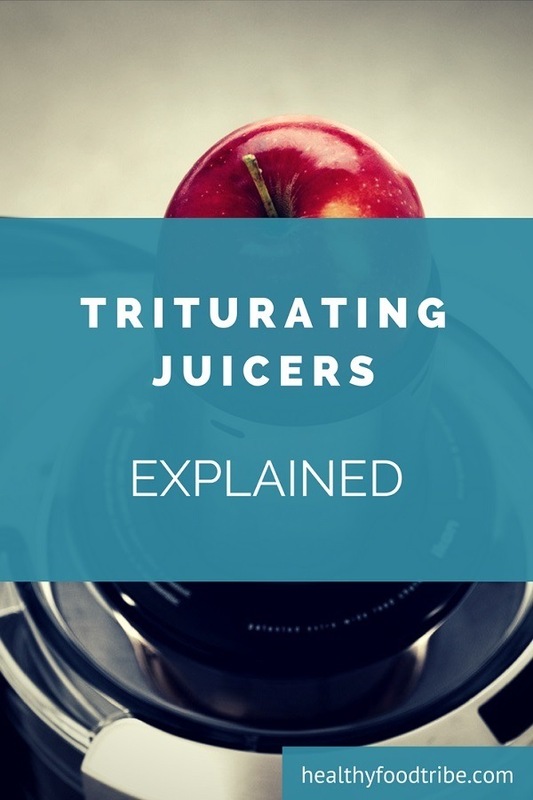 Let’s find out more about triturating juicers, how they function and which brands and models you should consider buying. >> Check out our comprehensive juicer buying guide. What Is a Triturating Juicer (aka Twin Gear Juicer)? Triturating juicers are a bit odd. It’s a type of juicer that’s not very well known. Most people would know centrifugal and, to a lesser extent, masticating juicers, but triturating juicers are still a bit of a mystery in the world of juicers. 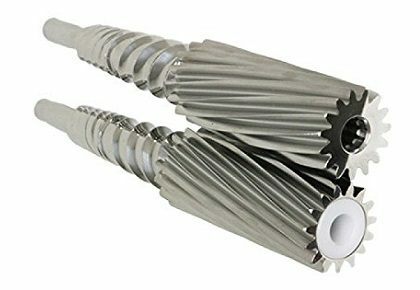 A triturating juicer is essentially the same as a masticating juicer with the main difference that a triturating juicer uses twin gears instead of a single gear. So in other words, a triturating juicer is a step up from a masticating juicer as it creates the best juice with the highest yield. Triturating literally means grinding to fine powder or thoroughly chewing or grinding food. The triturating process with twin gears involves first crushing fruits and greens and then extracting the juice. The result is very fresh and pure juice with all pulp removed. This process is typically slower than what a masticating juicer does. It also creates less heat which benefits the quality of the juice from a nutritional perspective. Because triturating juicers are so powerful and well designed, they are much more than just juicers. You can also use them as a food processor and create things like nut butters, baby foods and sorbets. The main drawback of a triturating juicer is that cleaning typically takes a bit longer because there are more parts. Although it must be said that manufacturers do take this into account and try to design twin gear juicers such that the cleaning process is not a showstopper for consumers. It’s no surprise that most triturating juicers are more expensive than centrifugal and masticating juicers. But if you’re serious about juicing and you want the best quality juice, then investing in a twin gear juicer may just be the right choice in the long term. Here is my top 3 best triturating juicers you can find on the market today, based on performance, price, features, manufacturer and reviews. 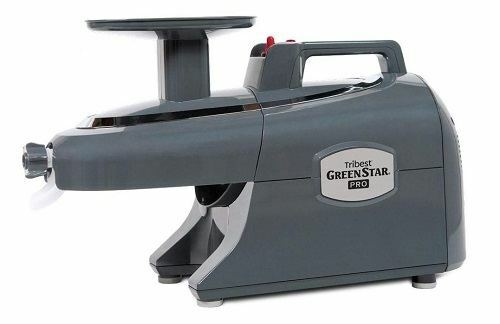 One of the all-time most popular twin gear juicers is the Greenstar by Tribest. This Elite model is the most recent version of the Greenstar and is available in the colors white, chrome and black. The Greenstar doesn’t just create fresh juices, it can also prepare nut butters, baby foods and sorbets. This juicer is essentially also a food processor and homogenizer. What’s great about this machine is that you can get yourself a top quality triturating juicer at a reasonably affordable price. And since Tribest has been around for so long and have such a wealth of specialized experience, you can be assured that they understand how to manufacture good juicers. This machine with advanced jumbo twin gear set is able to deliver the freshest tasting juice from your produce with maximum juice yield. With the Greenstar Elite you can adjust the amount of pressure that is required to separate juice from and to ultimately eject the pulp. As a result, this machine can handle a great variety of different types of greens without jamming or clogging. Different types of greens require a different amount of pressure within the juicing chamber in order to be most efficiently processed. The Greenstar basically gives you control over the amount of pressure that is to be used without interrupting the juicing process. The main advantage is that you can use different types of produce in one juicing session. The Greenstar Elite is relatively easy and quick to clean. It also has a convenient sure-grip handle on top so you can carry it around with ease. Triturating juicers can be somewhat on the heavier side so this is definitely a useful feature. Tribest offers a generous 12-year limited warranty on this top quality and affordable machine. The Tribest Greestar Pro is a small step up from the Greenstar Elite. It’s slightly more expensive and is designed to be used in both commercial as well as household environments. Tribest offers 3 years limited warranty for commercial use and a very generous 15 years for normal household use. The Greenstar Pro comes with all stainless steel twin gears to maximize durability without sacrificing the quality of the juice. The twin gears generate minimal heat while juicing which benefits the overall nutritional value of the juice. You can literally put all kinds of produce in this machine and it will turn it into juice, from carrots and kale to apples and wheat grass. Also important, this model comes with a safety switch which disables operation when the safety hood is removed. 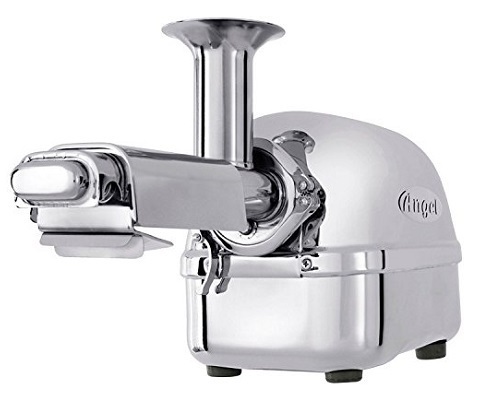 Super Angel has been a highly regarded manufacturer of twin gear juicers for more than three decades. Their exclusive models – the Pro, Deluxe and Permium Deluxe – can be seen as the Rolls-Royce in the world of juicers. While they may have a big price tag, they do produce top quality juices and they can last for decades. The very stylish looking Super Angel Pro has an attractive stainless steel construction. The juice that this machine is able to extract is the most nutrient-rich juice you could wish for at a very high yield. And not only does it create perfect juice out of pretty much all types of fruits and vegetables, it can also prepare nut butters, soy milk, tofu and fruit sorbets. It also features a an efficient anti-jamming system and makes little noise when in operation. It also comes with a self-controlling motor thermal sensor and an automatic cooling system for when the juicer gets overheated inside. Super Angel offers a generous 10-year limited warranty. Triturating juicers are definitely a step up from masticating and centrifugal juicers. They are typically far more expensive but they do last very long and they are able to prepare top quality juices out of all types of fruits and greens. If you’re just starting out with juicing, I would recommend to look for a good quality centrifugal juicer or a more affordable masticating juicer. If you do find that juicing has slowly become an important part of your lifestyle, it would perhaps be worth investing in a twin gear juicer.